(Analysis.) “All politics is moral,” writes cognitive scientist and author George Lakoff. For years he has counseled Democrats on winning hearts and minds from the dishonest, but effective, Fox News and Rush Limbaugh-style Republican propaganda. [S]tart with values, not policies and facts and numbers. Say what you believe, but haven’t been saying. For example, progressive thought is built on empathy, on citizens caring about other citizens and working through our government to provide public resources for all, both businesses and individuals. Use history. That’s how America started. The public resources used by businesses were not only roads and bridges, but public education, a national bank, a patent office, courts for business cases, interstate commerce support, and of course the criminal justice system. From the beginning, the Private Depended on Public Resources, both private lives and private enterprise. Over time those resources have included sewers, water and electricity, research universities and research support: computer science (via the NSF), the internet (ARPA), pharmaceuticals and modern medicine (the NIH), satellite communication (NASA and NOA), and GPS systems and cell phones (the Defense Department). Private enterprise and private life utterly depend on public resources. … And stop defending “the government.” Talk about the public, the people, Americans, the American people, public servants, and good government. And take back freedom. Public resources provide for freedom in private enterprise and private life. Of course, having, as the Republicans do, hundreds of radio stations and a major news network devoted to the messaging would greatly help. Still, every liberal-minded person that speaks a clear message grounded in values, whether to one or a million-and-one, would also help. Thomas Jefferson, who wrote the Statute of Virginia for Religious Freedom, and championed the separation between church and state, also praised those moral values. Jefferson cut-and-pasted from a bible into a blank book, leaving out the miracles and other passages he regarded as inauthentic. Thus, he made for himself a bible of only the teachings of Jesus of Nazareth — what Jefferson called “the most sublime and benevolent code of morals which has ever been offered to man.” Off-and-on over the years, the Jefferson Bible has been given to the new incoming members of Congress, as each was sworn in. spread the word that it’s not the “Religious Right” who are the friends of Jesus (they are the very kind of people who were the mortal foes of Jesus of Nazareth all his life). It’s liberals — some of whom don’t even believe in the existence of God — who strive to promote the welfare of the most needy people in our world — which is what Jesus of Nazareth promoted better than most. … [I]t is virtually impossible to believe what Jesus Christ taught AND be Conservative in America today. Rather, one must make a choice between being either self-centered (and Conservative), OR community-directed (and Christian). … What we are striving to achieve is to alert good Liberals like yourself to the tremendous opportunity that lies hidden in the terrible success of the “Religious Reicht”. The vast majority of those who follow and support the insincere leaders of this movement are inherently good -– if temporarily misguided -– Americans. They are devoting their time, money and energies to what they have been led to believe are good and holy causes. What we propose to do is to reach as many of these innocent victims as possible and show them how out of step they are with the very founder and leader of Christianity whom they want to believe in and follow, Jesus of Nazareth. They will then understand that to follow Christ in America these days is to be a very dedicated and activist Liberal! Again, having many radio stations — especially throughout the “Bible Belt” — would greatly help. Still, every liberal-minded person that speaks a clear message based on the moral values system of Jesus of Nazareth, whether to one or a million-and-one, would also help. An eye for an eye, and a tooth for a tooth? (9-8/Matthew 5:43) “You have heard that it was said, ‘You shall love your neighbor, and hate your enemy.’ But I tell you, love your enemies, bless those who curse you, do good to those who hate you, and pray for those who mistreat you and persecute you, that you may be children of your Father who is in heaven. For he makes his sun to rise on the evil and the good, and sends rain on the just and the unjust. For if you love those who love you, what reward do you have? Don’t even the tax collectors do the same? If you only greet your friends, what more do you do than others? Don’t even the tax collectors do the same? (11-11/Matthew 6:19) “Don’t lay up treasures for yourselves on the earth, where moth and rust consume, and where thieves break through and steal; but lay up for yourselves treasures in heaven, where neither moth nor rust consume, and where thieves don’t break through and steal; for where your treasure is, there your heart will be also. (12-2/Matthew 6:24) “No one can serve two masters, for either he will hate the one and love the other; or else he will be devoted to one and despise the other. You can’t serve both God and Mammon (money). (Jeff 13-4/Matthew 7:3) Why do you see the speck that is in your brother’s eye, but don’t consider the beam that is in your own eye? Or how will you tell your brother, ‘Let me remove the speck from your eye;’ and behold, the beam is in your own eye? You hypocrite! First remove the beam out of your own eye, and then you can see clearly to remove the speck out of your brother’s eye. (13-8/Matthew 7:7) “Ask, and it will be given you. Seek, and you will find. Knock, and it will be opened for you. For everyone who asks receives. He who seeks finds. To him who knocks it will be opened. Or who is there among you, who, if his son asks him for bread, will give him a stone? Or if he asks for a fish, who will give him a serpent? If you then, being evil, know how to give good gifts to your children, how much more will your Father who is in heaven give good things to those who ask him! (61-7 /Matthew 23:13) “Woe to you, scribes and Pharisees, hypocrites! For you devour widows’ houses, and as a pretense you make long prayers. Therefore you will receive greater condemnation. Woe to you, scribes and Pharisees, hypocrites! For you tithe mint, dill, and cumin, and have left undone the weightier matters of the law: justice, mercy, and faith. But you ought to have done these, and not to have left the other undone. You blind guides, who strain out a gnat, and swallow a camel! (73-9/Matthew 26:50) Then they came and laid hands on Jesus, and took him. Behold, one of those who were with Jesus stretched out his hand, and drew his sword, and struck the servant of the high priest, and struck off his ear. Then Jesus said to him, “Put your sword back into its place, for all those who take the sword will die by the sword. 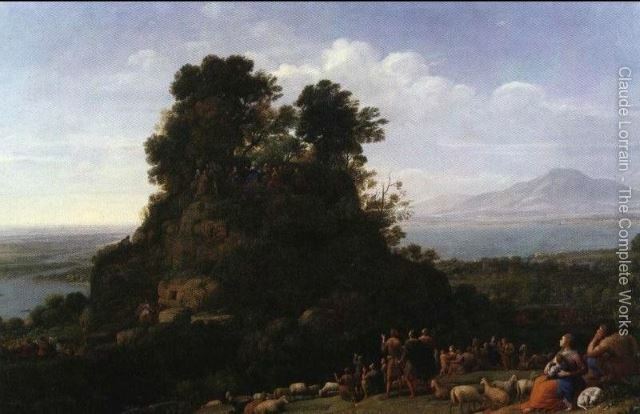 Image: ‘The Sermon on the Mount’ by Claude Lorrain, 1656; found at ClaudeLorrain.org. separation between church and state “Extract from Thomas Jefferson to the Baptist Association of Danbury, Connecticut” Jan 1, 1802. Believing with you that religion is a matter which lies solely between Man & his God, that he owes account to none other for his faith or his worship, that the legitimate powers of government reach actions only, & not opinions, I contemplate with sovereign reverence that act of the whole American people which declared that their legislature should ‘make no law respecting an establishment of religion, or prohibiting the free exercise thereof,’ thus building a wall of separation between Church & State. [I]t is virtually impossible ibid. Love this, Quinn. Seeing that my family counts among it many Conservative “religious Reicht” members, the words hit very close to home. Here’s to the light breaking through.